Home Politics R.I.P. and BTW there’s a half-off sale on men’s briefs! R.I.P. and BTW there’s a half-off sale on men’s briefs! 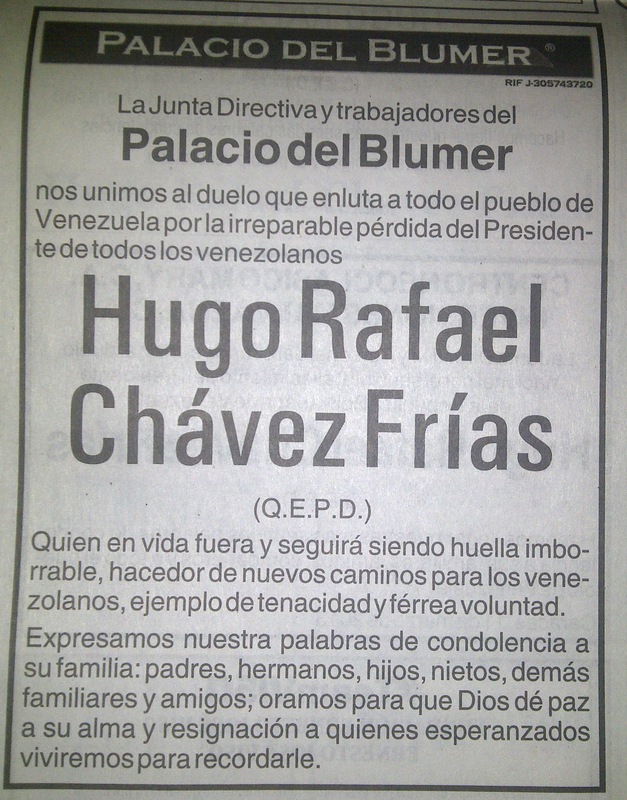 Ever since Wednesday of last week, the Obituaries sections of the main Venezuelan newspapers look more like the yellow pages than they do a place of bereavement. Local and multinational companies, big, medium and small, all deem it necessary to publicly communicate their respects to our departed President. Everyone from McDonald’s de Venezuela and Fox Television Networks to Festejos Mar, and my personal favorite, El Palacio del Blumer, is jumping on the death-notice bandwagon, and oddly enough, with every day gone by since Chavez’ disappearance, the number of obits grows larger. It’s already quite folkloric, this whole tradition of taking out funeral notices for people who aren’t actually in your family. But the upwards trend in Chavez obits 9 days after his death begs an interesting question. Is the private sector happily making use of this media-centric opportunity for cheap press? Or is this desperate attempt to feign solidarity with El Comandante’s passing more about fear? After all, if and when McDonald’s is up for expropriation, they can always point to the full-page ad they took out in El Nacional to assert their political alignments. That’s gotta count for something, no?